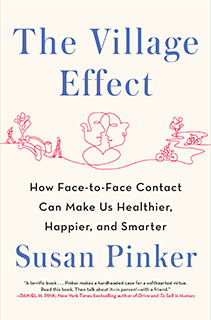 In this surprising, entertaining and persuasive new book, psychologist Susan Pinker shows how face-to-face contact is crucial for learning, happiness, resilience and longevity. From birth to death, human beings are hard-wired to connect to other human beings. Face-to-face contact matters: tight bonds of friendship and love heal us, help children learn, extend our lives and make us happy. Looser in-person bonds matter, too, combining with our close relationships to form a personal “village” around us, one that exerts unique effects. Not just any social networks will do: we need the real, in-the-flesh encounters that tie human families, groups of friends and communities together. 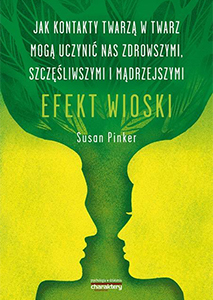 Marrying the findings of the new field of social neuroscience with gripping human stories, Susan Pinker explores the impact of face-to-face contact from cradle to grave, from city to Sardinian mountain village, from classroom to workplace, from love to marriage to divorce. Her results are enlightening and enlivening, and they challenge many of our assumptions. Most of us have left the literal village behind, and don’t want to give up our new technologies to go back there. But, as Pinker writes so compellingly, we need close social bonds and uninterrupted face-time with our friends and families in order to thrive―even to survive. 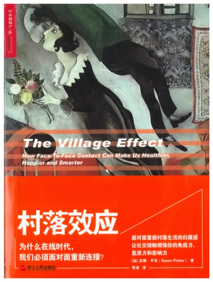 The Village Effect was published in Canada and the US in 2014, and will be published in the UK, Korea, China, Turkey and Poland in 2015. "Good peers help make centenarians." 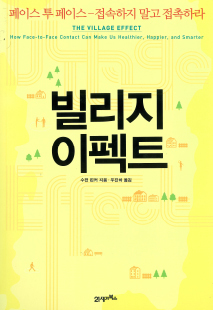 "Drawing on scores of psychological and sociological studies, Pinker suggests that living as our ancestors did, steeped in face-to-face contact and physical proximity, is the key to health, while loneliness is less an exalted existential state than a public health risk; ...smart readers will take the book out to a park to enjoy in the company of others." "The benefits of the digital age have been oversold. Or to put it another way: there is plenty of life left in face-to-face, human interaction. 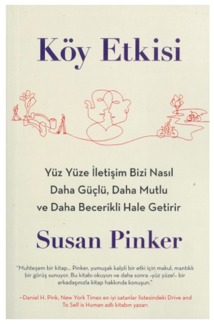 That is the message emerging from this entertaining book by Susan Pinker, a Canadian psychologist. Citing a wealth of research and reinforced with her own arguments, Pinker suggests we should make an effort - at work and in our private lives - to promote greater levels of personal intimacy." "Intimate, face-to-face contact with partners, family, and friends is an ancient and deep human need. How do group-living primates like us make the transition to an online world in the evolutionary blink of an eye? Can they? Pinker shows how this is happening. And -- even more important -- she shows us how this should happen -- with a valuable prescription based on the best science. Pinker writes with authority and verve, and she offers an integrated treatment of online and offline interactions. She sketches our modern digital interactions on the ancient parchment of our minds." 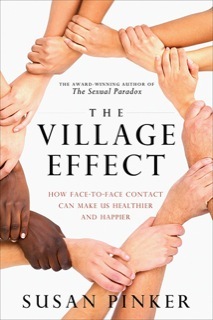 "In a time when we rely increasingly on virtual forms of communication and networking, The Village Effect is an important reminder of the value we derive from our real, personal networks--and what we lose when we replace them with the social networks of the online age. Susan Pinker has written a fascinating, nuanced study of that most fundamental need: the need for human connection. No matter how far technology evolves, she reminds us, some things can never be replaced." 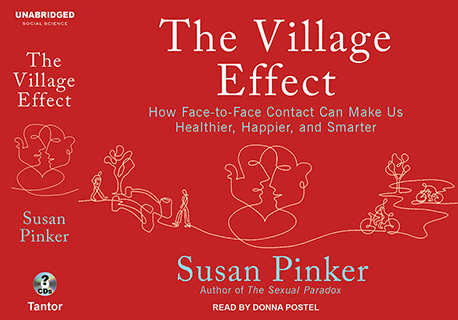 "Susan Pinker's The Village Effect is a bold, intelligent foray into what social isolation does to each of us in an age of technology. She offers keen insights into how social engagement enhances romance, parenting, career, family and friendship. Most impressively, Susan Pinker explores how gender and invisible social forces play into our daily lives." Paul Bloom / Brooks and Suzanne Ragen Professor of Psychology, Yale University. Author of “Just Babies: The Origins of Good and Evil”. "In this provocative and engaging new book, Susan Pinker shows how intimate social contact is a fundamental human need, and argues that Facebook, Twitter, and the rest of social media fail to meet this need, diminishing the lives of children, teenagers, and everybody else. Pinker is a great storyteller and a thoughtful scholar, and she expertly blends together personal stories and scientific research about marriage, cancer, obesity, happiness, longevity, religion, menstrual synchrony, solitary confinement, and much more. This is an important book, one that will shape how we think about the increasingly virtual world we all live in." "What do Sardinian men, Trader Joe’s employees, and nuns have in common? Real social networks—though not the kind you’ll find on Facebook or Twitter. Susan Pinker’s delightful book shows why face-to-face interaction at home, school, and work makes us healthier, smarter, and more successful." "We have a biological drive for social interaction. We long to belong. Susan Pinker’s new book reveals the type of social contact that makes us tick. Written with verve, warmth, and style, it presents new science about what matters — raising healthy kids, leading a long and engaged life, being successful at work and play. This is a gem of a book!" "For those who look forward to life with cool robots, think again. Pinker shows us crucial personal interactions are essential to true human feelings. Brilliant and compelling." John Tierney / Co-author of the NYT bestseller, "Willpower"
"Why would a weekly meal with friends add as many years to your life as quitting smoking? Why is face-to-face so much better than Facebook? Susan Pinker has the answers. With her usual flair and expertise, she combines the latest neuroscience and social psychology with stories of villagers in Sardinia, nuns in America and the dating scene in Montreal. It’s a fascinating explanation of why we need regular contact with people, not just screens – and why time spent with your neighbors will enrich and extend your life in ways you never imagined." "Do you like email, text messages, and social media? So do I. 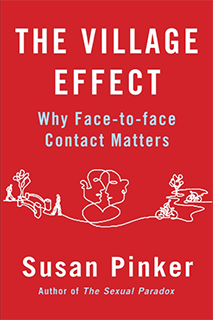 But as Susan Pinker shows in this terrific book, electronic communication can never replace our deeply rooted, fundamentally human need for face-to-face interaction. Drawing on cutting edge research in social neuroscience, and supplementing the science with case studies and sharp observations, Pinker makes a hardheaded case for a softhearted virtue. Read this book. Then talk about it — in person! — with a friend." "Susan Pinker has applied her keen intelligence to the question of human flourishing. This lively and meticulously researched book shows that face-to-face human interactions—not computer mediated communication—are key to our well-being. Direct and frequent human contact are at least as important to our survival as clean air or good nutrition. “Hell is other people,” declared the French philosopher Jean-Paul Sartre. Not so, says Pinker.With a raft of surprising data, this compulsively readable book reminds us that loneliness and isolation are our blights--other people are the source of our happiness." Wisconsin Public Radio; Can Students Have Too Much Tech? CBC Maritime Noon: Do You Know Your Neighbours?